If the unusual title of the CD leaves you somewhat perplexed, Andris Brinkmanis and Diana Ketler go to great pains to explain it in the booklet notes. 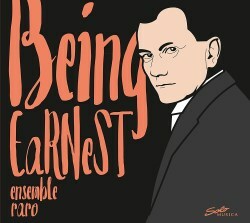 A tenuous connection is made between the composer and the protagonist Jack (also known as 'Ernest') in Oscar Wilde's play The Importance of being Earnest. The events surrounding Dohnányi's extra-marital affair with Elza Galafrés, a well-known singer and actress married to the violinist Bronislaw Huberman, finds some echoes in the Wilde oeuvre. Also, like the author, the composer fell prey to the judgemental attitudes of his contemporaries. Like that fellow Hungarian Franz Liszt, Ernő Dohnányi’s versatility was manifest in his various roles as composer, teacher and conductor. He was also renowned as a concert pianist, a career kick-started by his graduation from the Budapest Music Academy in 1897. Two years previously he had completed his first Piano Quintet, which was enthusiastically given the thumbs-up by Brahms, who greatly influenced the younger composer. The Second Quintet followed nineteen years later in 1914 and, by then, Dohnányi had found his own voice. I’ve never really understood why this captivating work has never gained the popularity, both in the studio and the concert hall, of the quintets by Brahms, Schumann and Dvořák. I find it more inward-looking and serious than the First Quintet, and perhaps this goes some way to offering an answer. The opening movement is lushly romantic, with grand gestures and an underlying melancholy. Even the short Intermezzo, with its lilting rhythms, fails to raise much of a smile. The light, ‘Mendelssohnian’ section one minute in, is wonderfully articulated by the strings. The plaintive tones of the solo cello usher in the finale, and one by one the other instruments make their entrance. Finally the piano enters and is heard in a sort of sombre chorale. The mood remains subdued throughout, and an air of peace and tranquillity ends the work. Fast-forward twenty years to 1934, and we have the C major Sextet, for clarinet, horn, string trio, and piano. Drafted on a large scale, its four lushly-scored movements follow the classical mould. There so much passion in the opening movement, and the Ensemble Raro play their heart out. In contrast, the slow movement starts off more tranquil, offering some soothing balm. This is eventually interrupted by a marching rhythm, but serenity returns at the end. The solo clarinet opens the third movement, which to me sounds quite Brahmsian. It’s not long before the pace quickens, and this neatly leads into a vigorous and energetic finale, which follows without a break. Dohnányi introduces a sensuous sentimental waltz two minutes in, which returns more fleshed out near the end. The commitment and passion the Ensemble Raro bring to these delightful scores, in addition to their immaculate ensemble, is a winning element. Their performances are superbly stylish. The acoustic of the Studio 2, Rundfunk München confers warmth and intimacy on the sound. This is chamber music playing of the highest calibre.